A team of enthusiastic experts in the crypto field has created Ruby Exchange Project, aiming to build a platform where people can trade funds, technology and information as well as cryptocurrency through Ruby Exchange, Ruby-x. The Ruby Exchange is the platform run transparently with expandable and unbreakable functions. Moreover, Ruby-x will create an ecosystem based on its main net and it will use Ruby tokens (RBY) as the main currency, which is highly valued and limited. Ruby-X prides itself on bringing a new concept of crypto exchange through combined selling that would efficiently see different trading services. The Ruby Exchange has developed a new solution that will enable a whole new level of transparency in management and security in the trading and exchange of services. The efforts would see Ruby-X become one of safest trading ecosystems that provide users with transparent management, secure facilities and a customizable portal for trading. Ruby Exchange will be one of the world-class exchanges. It starts with a crypto exchange, but you will be able to exchange, buy, and sell everything on Ruby, from something tangible to something intangible. You will be able to exchange your passion on Ruby-X. Project Ruby is one of the most massive projects in the crypto industry. Passion into the holder’s life, Ruby Token (RBY) Ruby-x is aiming to build an ecosystem based on its main net of POC. 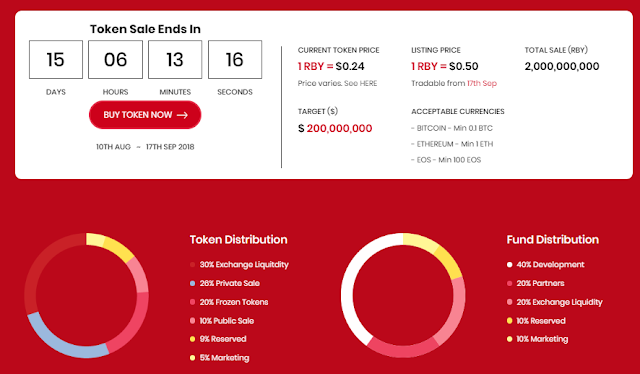 The token of Ruby-x, RBY, is currently based on ERC-20, but after the main net launch in 2021, RBY will be used as RUBY main net’s main currency to constitute the decentralized ecosystem. High Value of Ruby Token All fees on Ruby-x will be paid with the key currency of Ruby-x, RBY, and it will eventually replace USDT, ETH, and BTC used on Ruby-x. Once the service is released, RBY can be exchanged with all other listed cryptocurrencies. Plus, the top 5000 RBY holders will receive the dividend profits of Ruby-x, 40% of profits or 10% of revenue, every quarter of each year. Ruby seeks to launch the Ruby-X Mobile app as an advanced mobile trading platform that will bear all the necessary features and functionalities to enable crypto trading and exchange. The app will allow portfolio management, superfast crypto trading, conversion into fiat, and global transactions. Ruby token is the exchange's native currency that facilitates the transactions, fees, and participation of the Ruby-X users. The token will be available only through one token sale with the supply set at 10% of the total token amount. Additionally, the public auction will have users purchase the tokens at half the price. There is complete transparency in the transaction disclosures, fee history and access to all data aspects within Ruby-X. The lead RBY token holders will receive an annual share of the profits generated by Ruby-x. The gain could also be held in custody on behalf of the users for future investment or sharing. The use of cold wallets safeguards the user's details and cryptocurrency from the prying eyes of hackers and malicious individuals. The Ruby Exchange will offer advanced trading services that would see the exchange of information, technology, funds and other entities. The emphasis on efficiency and security is evident from Ruby-X use of next-generation tech with the likes of AI trading, machine learning capabilities, and a real-time server. Ruby-x is a relatively new cryptocurrency exchange that could see stiff competition from the myriad of exchange platforms in the market. Despite that fact, Ruby-X remains an exciting exchange to try out and test to see whether it's a suitable option for your crypto trading.